The Andes mountains. Vast deserts and valleys. Lush rainforests. And over 1,400 miles of beaches. The landscapes of Peru are as varied as the districts and people of its capital Lima (43 neighborhoods with nearly 9 million people…and counting). 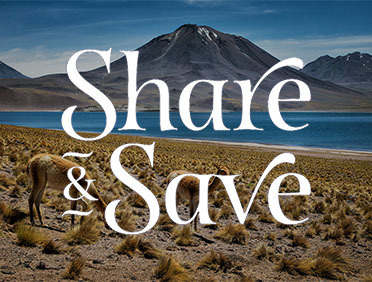 Because of its unique geography and primarily undisturbed ecosystems, the country is home to over 21,000 species of plants animals, with more than 25% of them native to Peru. It’s also home to renowned eco-adventure destinations like Machu Picchu, Nazca, Paracas National Reserve, and the Amazon. In addition to exploring Peru’s natural wonders, no trip here would be complete without sampling the local cuisine. Peruvians are obsessed with food, and it shows in such popular dishes as ceviche, lomo saltado (stir-fried beef), choclo con queso (corn with cheese), aji de gallina (a creamy chicken stew), and alfajores (dulce de leche-filled shortbread cookies). Cap your meal with a pisco sour—the national drink that combines pisco (grape brandy) with lemon juice, syrup, bitters, and an egg white—and say, “Salud!” to another great day in Peru with Azamara. Dating back 500 years, Machu Picchu and its complex of plazas, temples, and terraces is a must-see New 7 Wonders of the World—and you can experience it with one of Azamara’s pre- or post-voyage packages. The Nazca Lines are comprised of 700 geoglyphs, and represent everything from basic shapes like spirals and triangles to more elaborate drawings of animals, insects, and birds, including a 935-foot-long pelican. Just a 45-minute drive from Lima is the historic center of Arequipa. Built in white volcanic rock, the city’s architecture is celebrated for combining traditional indigenous styles with European Colonial techniques. 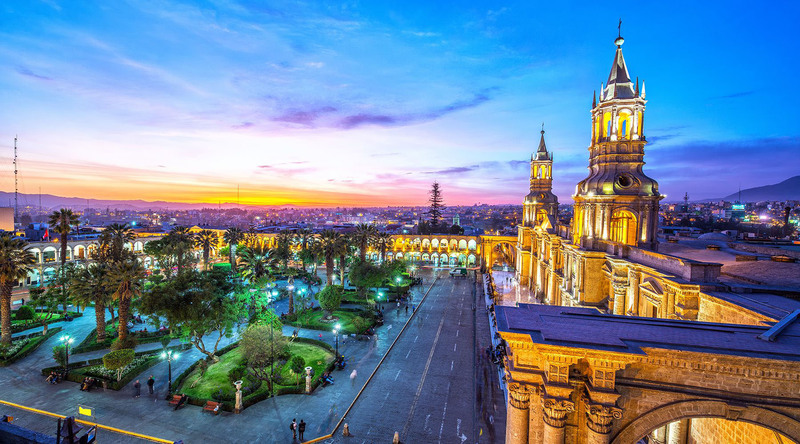 Also a UNESCO World Heritage Site, the historic center of Lima (known as “the City of Kings”) is home to Plaza Bolivar, Government Palace, Cathedral of Lima, iconic churches, and much more. Explore local neighborhoods like the bohemian Barranco or Miraflores, offering everything from the ancient ruins of Huaca Pucllana to Larcomar, a multi-level entertainment complex built into the cliffside. A six-mile stretch of parks situated high on cliffs that overlook the Pacific, El Malecón is not only a prime spot for watching parasailers, but it’s also perfect for jogging, biking, or taking in panoramic views. The “City of Eternal Spring” is considered one of the most elegant destinations in Peru. It’s filled with Colonial- and Republican-era mansions and monuments, and a church on seemingly every corner. The historic center of Trujillo is a veritable treasure trove of sights: the Plaza de Armas, Freedom Monument, Cathedral of Trujillo, Itúrregui Palace, and numerous museums, galleries, and shops. In the nearby river valley, there are more than 2,000 archaeological sites, including Huaca del Sol, Huaca de la Luna, and the ancient Chimu capital of Chan Chan (another Peruvian UNESCO World Heritage Site).